Unique. Functional. Versatile. What better way to describe the pottery of artist Natalie Thomas. Hand thrown at her studio The Potter’s Obsession; these chip and dip bowls will grace your holiday table with a unique style and as a conversation piece. What a wonderful gift idea for those who love to entertain. A new addition to Natalie’s entertaining pieces are her hand built olive tray holders. These slender shaped pieces are versatile in the fact that they not only hold olives but are also a unique way to display strawberries too. Happy Entertaining! Would you like to knit without your ball of yarn rolling across the floor? Natalie’s colorful hand thrown yarn bowls will solve this problem and will make the perfect gift for those who work with yarn or thread. These pieces are also dishwasher and food safe so you could use them as a unique fruit bowl too! Let’s not leave those gardening gifts for the spring and summer months. 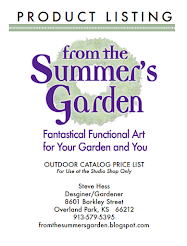 The holiday season is the perfect time to give the gift of garden art. 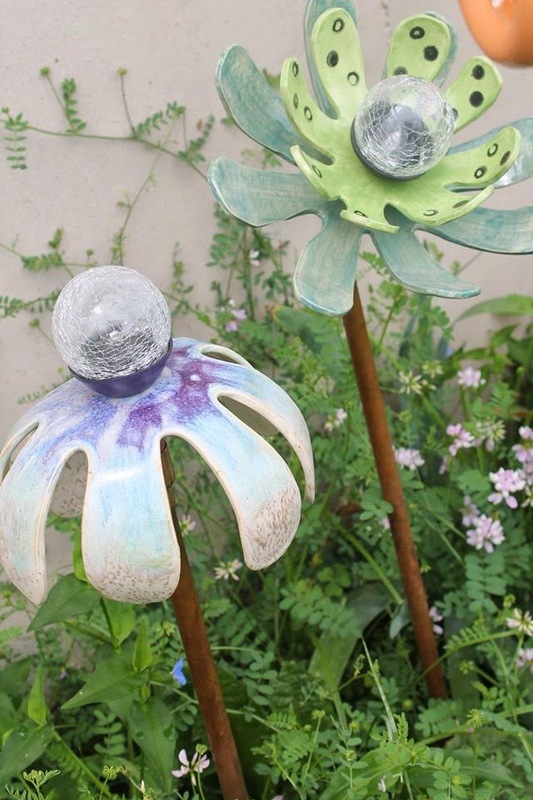 Natalie’s creatively hand built solar flower lights will compliment your garden by day and illuminate it by night. Karen Skillett has been crafting some new garden gnomes (influenced of course by our wonderful boys in blue!) 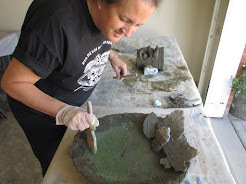 as in past years the gnomes are cast from antique chocolate molds and as of last spring all of Karen's chocolate mold castings are weatherproofand ready to grace your planter or fairy garden! New this year from Karen are jewelry creations from tumbled sea glass and pottery pieces. These fun and beautiful pendants, sold in seashell trays or drawstring bags, make great holiday gifts! 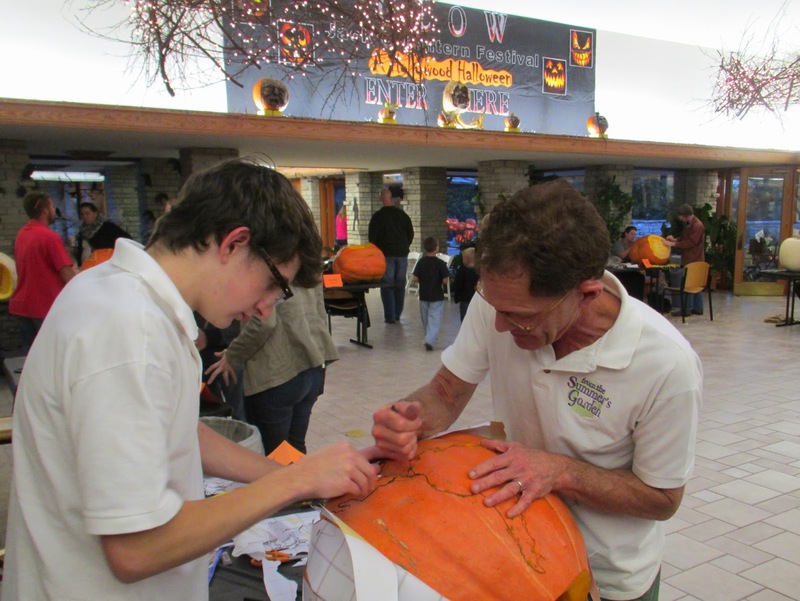 From the Summer's Garden was asked to participate in the pumpkin carving event at Powell Gardens. 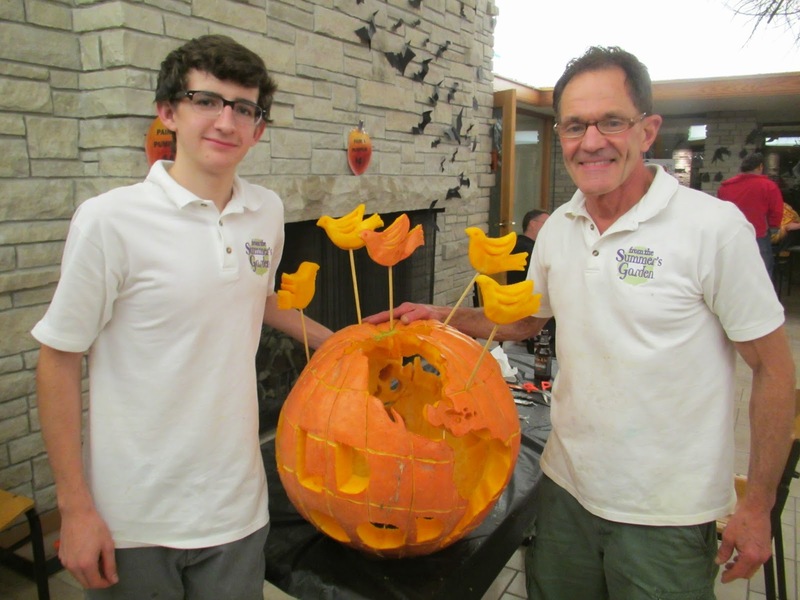 The exciting work will be on display this weekedn During their GLOW event.They have so many unique methods for lighting the pumpkins. Check out their site for all the details: http://www.powellgardens.org/glow#.VEHbJigyskk. Matt, Laurie and I carved this globe surrounded by flying doves in anticipation of our holiday sale, A WORLD OF GOOD... coming in November! Robin likes to rescue things. A scrap of beautiful handmade paper here, an orphan button there, pages from a long forgotten book. She likes to give these items an interesting new life as something inspiring for the eye and soul. For the upcoming From the Summer's Garden Holiday Sale, Robin has created a new line of Found Button jewelry featuring bracelets that dance and sing. Robin has also been collaborating on a series of Paper Princess wall hanging featuring cutoffs from parent sheets of handmade paper made from recycled clothing. Sparkling wall hangings, fun, funky Love and Luck tassels and scrapped Christmas trees! And last, but not least she has made a small series of Little Fatties. 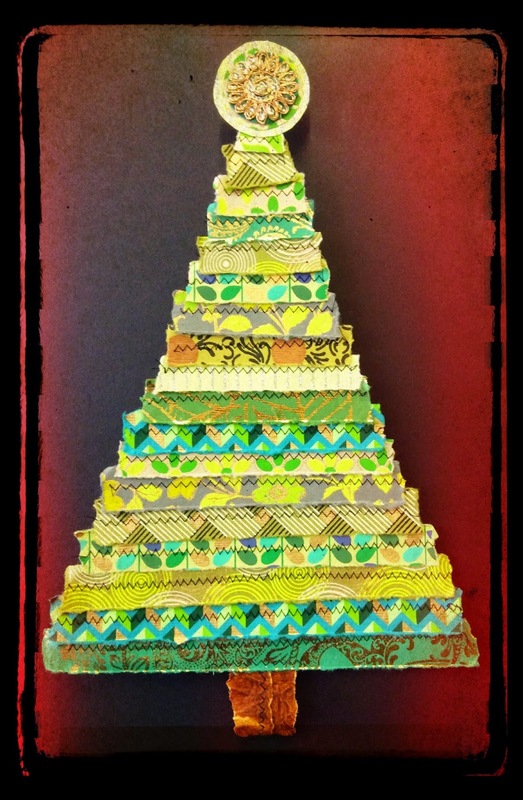 3 1/2" square personal journals made from every sort of paper scrap imaginable. Come see Robin's new visual treats! The perfect way to start your holiday shopping! 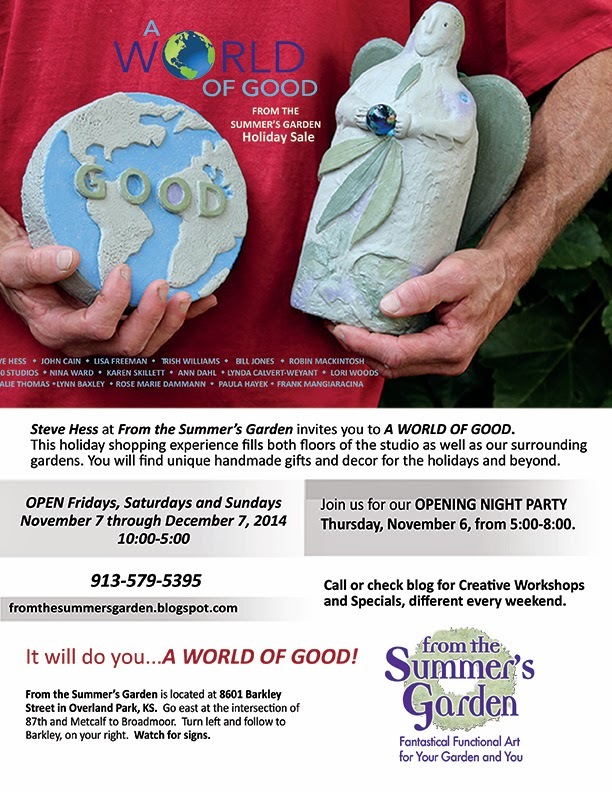 Frank is excited about the products he's creating for our upcoming holiday sale at From The Summer's Garden. He loves greeting familiar customers and welcoming new ones, helping them to discover what's new this year. The sale is always fun and casual with lots of smiles and warm greetings. His new items this year include trivets, Lazy Susans, and jewelry chests. Frank has several new designs in jewelry organizers and keepsake boxes too. There will be many of his regular items available as well. 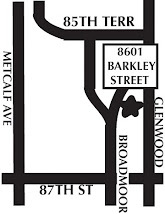 Frank works with with exotic woods from North and South America, Central America, Philippines, Africa and Asia. He finishes the woods with natural oil to bring out the true color and beauty of the woods, and then applies varnishes, urethanes and or waxes depending on usage. All food use items such as bread boards, bowls and trivets are food safe. Make it a point to check out Frank's beautiful work-it'll do you world of good! 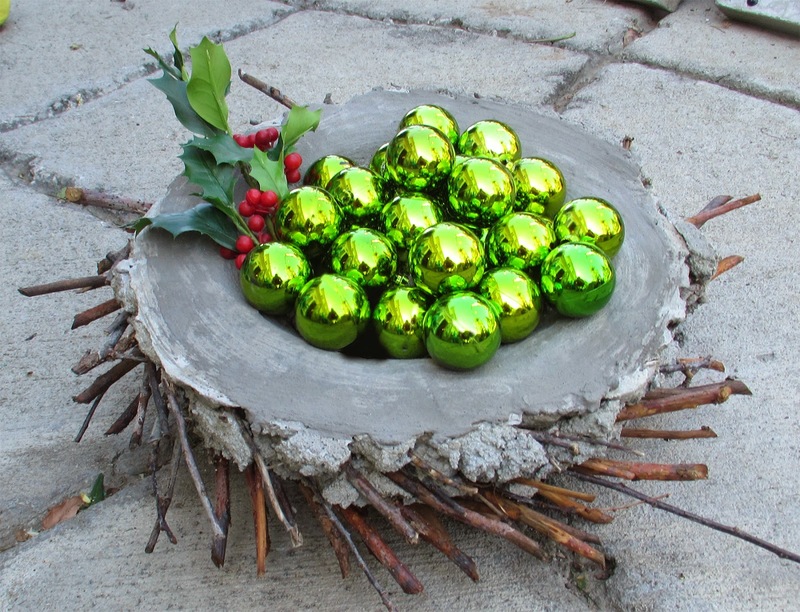 Make this simple container for a unique garden holiday decoration now and use it as an interesting planter in spring. 1. Cover large bowl with plastic wrap and place open side down on plastic-covered work surface. Use the pruning shears to cut 3-4-inch lengths of twigs from the branches. Use the forked branches as well as these will help to provide a natural look. Cut the twigs at 45-degree angle and build up a nice pile…whose going to count? 2. 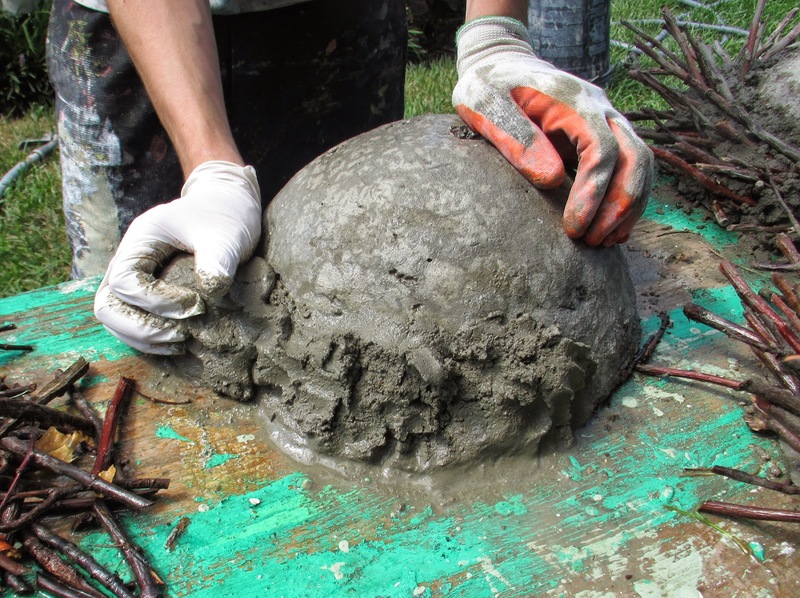 Mix sand topping concrete mix with water to a clay-like consistency and cover the surface of the bowl with an inch-thick layer of concrete. Pat lightly for a nice smooth surface. Poke a drain hole in the bottom with your finger. Hypertufa works perfectly for this portion of the project and results in a much lighter finished result. 3. 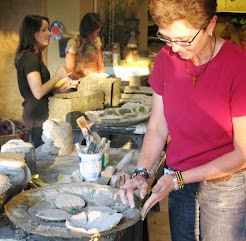 When you’ve covered the bowl, add a thick rim of concrete along the outside edge of the bowl. Do not smooth this out. Instead make it rough and uneven. 4. 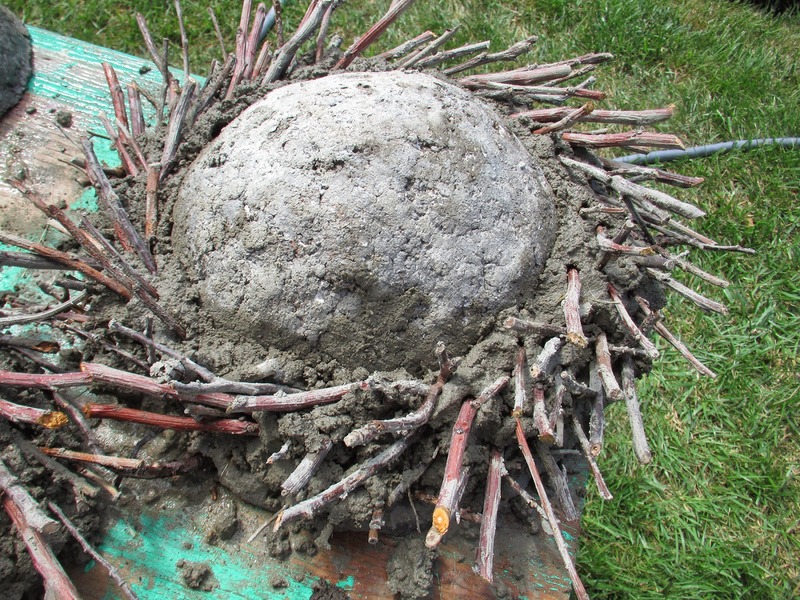 Stick the ends of the twigs into the concrete rim at an angle and move completely around the bowl until you have built a nest. Allow to harden overnight. 5. The next day all you have to do is turn the nest container over, remove the bowl, trim up any rough spots and decorate for the holidays. This container can stay outside year round. Holiday Sale in November and December: A WORLD OF GOOD! 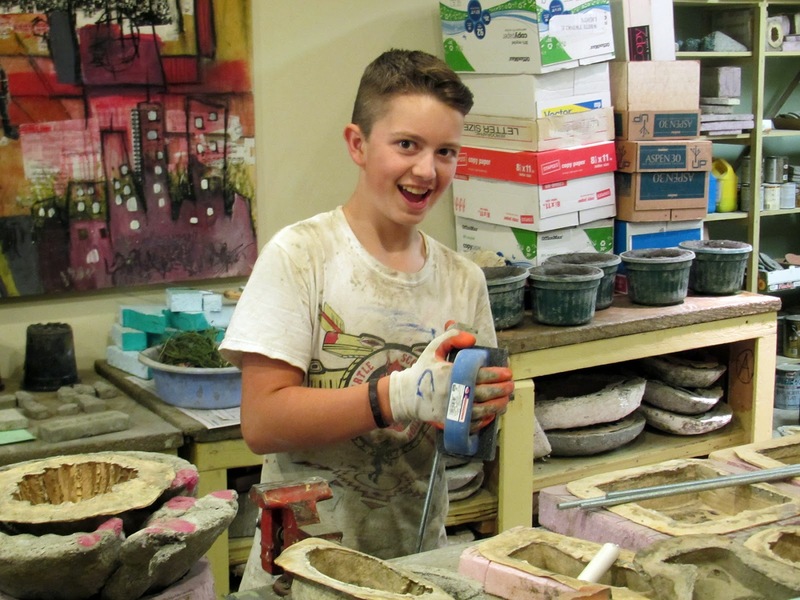 Chase successfully completed his 2-month apprenticeship in From the Summer's Garden's studio. 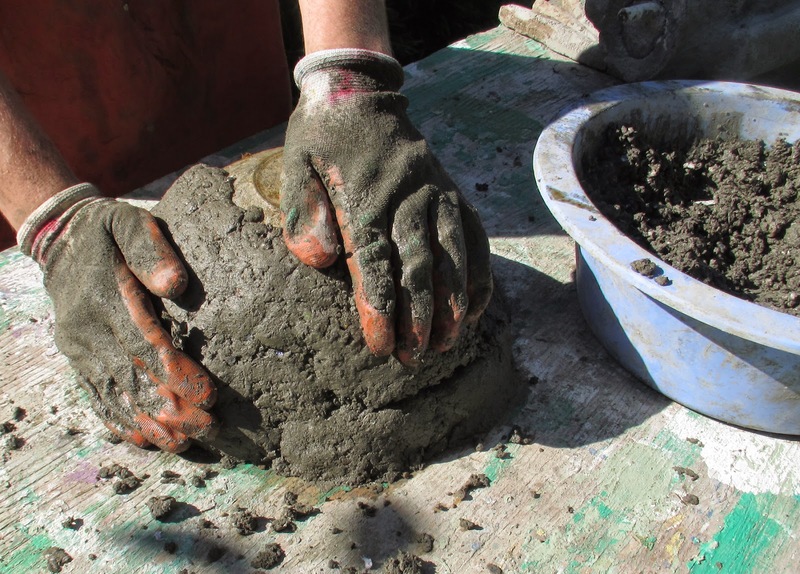 He learned the ropes of mixing concrete, hypertufa and the making of handmade paper. Matt and Joe were good mentors and helped him through the process. It seems every apprentice tips a full wheelbarrow of concrete into the lawn. Chase didn't exactly do this, but he did loose a barrow full of finished garden stones! Ah, but it happens to all of us and we are very happy to have him on board. Look for his smiling face at our upcoming Holiday Sale in November.